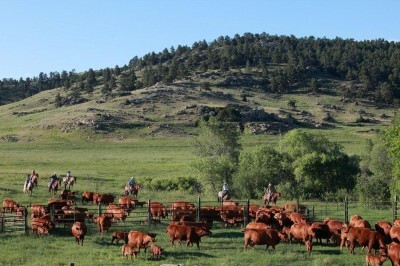 Wagonhound Land & Livestock Beef now available at Wyoming Gourmet Beef! Since Wyoming became a state in 1890, its ranchers have taken great pride in the way they have raised their cattle. Wyoming has always been known for its rich western heritage, creativity, the rugged independence of its people, pristine environment, rich resources, and beautiful, diverse, unique nature. From the Grand Tetons of Jackson, to Heart Mountain of Cody, the Big Horn Mountains of Sheridan, and the Snowy Range of Laramie, the wide open spaces and grasslands are what make our ranching great! Wyoming’s ranchers and feedlot operators have worked hard, generation after generation, to produce consistently high-quality cattle. Wyoming Authentic Products sources cattle exclusively from these Wyoming ranches, with exact specifications for cattle born, raised, and fed in Wyoming. Click here to visit Wyoming Gourmet Beef to place your order!